Want to improve your content marketing strategy and attract more traffic to your site? Google Analytics can help you a lot by letting you know exactly what to focus on and improve. In this article, we’ll show you 6 Google Analytics reports that’ll help you improve your content marketing strategy. First of all, let’s discuss what content marketing is in brief. If you break down content marketing, it has 2 words: content and marketing. Content refers to a piece of information in written, audible, or visual form. For example, blog posts, podcasts, videos, and infographics are the most commonly-used web content. And, marketing means telling people about your products and services so as to convince them to buy. Hence, content marketing can be defined as a way of promoting your business (products and services) with content. It involves the entire process of creating a great content and sharing it with your target audience. Content marketing is one of the oldest forms of marketing techniques and also one which is still very popular and relevant. In the past, people used to create content and distribute it physically — put them up on the hoarding boards, etc. But, nowadays, the web gives us a platform to create and share content more efficiently. Not to mention, content marketing is the favorite technique of digital marketers today. If you can do it just right, you can attract more traffic, leads, and sales. And, Google Analytics can help you to do it the right way. Google Analytics is the most popular website analytics service in existence and can provide you with detailed and in-depth insights about your website traffic and your visitors’ behavior on your site. What keywords they’re using to find your website, etc. With this information, you can be very precise about what type of content you should create and how to promote it. That’s how Google Analytics can help you to do content marketing the right way. If you’re wondering how to use Google Analytics in WordPress easily, MonsterInsights is the answer. MonsterInsights is the most user-friendly Google Analytics plugin for WordPress. It helps you to set up Google Analytics in WordPress easily and provides you with Google Analytics reports inside your WordPress dashboard. In addition, it makes advanced tracking in Google Analytics super easy for beginners. You can easily set up tracking advanced metrics like eCommerce, file downloads, forms, etc. 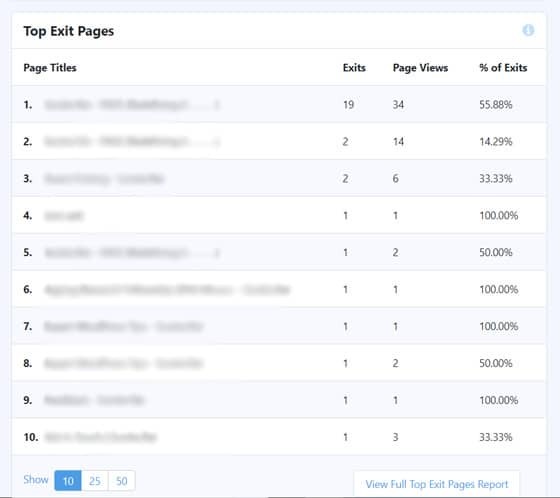 Now, let’s go ahead and check which Google Analytics reports can help you improve your content marketing and how to track them. Google Analytics, by default, tracks the geographical location of your site visitors, so MonsterInsights shows you the top countries report as a part of your site’s overview report. 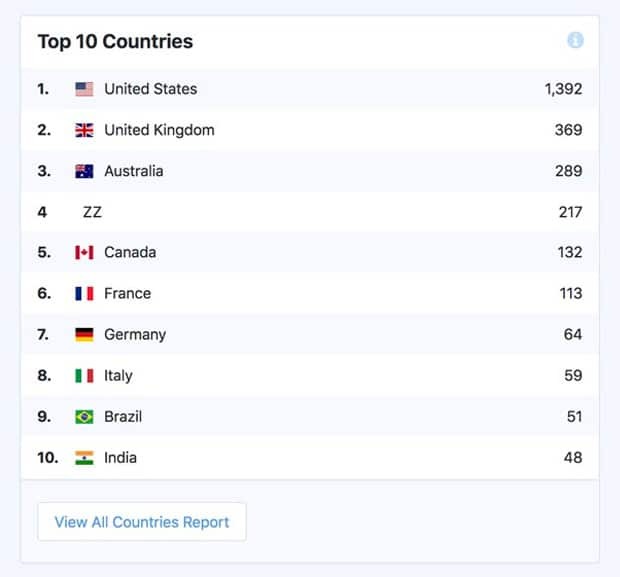 After setting up Google Analytics in WordPress, you can go ahead and view the top countries report by going to Insights » Reports from your WordPress dashboard. Now, you can see the top 10 countries from where your site has most visits. There’s precisely the number of visits after each country’s name. First, you can check whether your content marketing is doing okay or not. For a specific type of business, you’ll surely have a certain country or city in mind who can be your potential customers. If your current site traffic is mostly from the location you want, you’re doing great. Otherwise, you’ll have to check what’s keeping your site from attracting your target audience and create a strategy that can really draw them in. Similarly, you can discover new locations where you’ll need to focus. Sometimes, you can find other locations than you expected where you’ll find plenty of customers. Second, you’ll also know where your ad campaigns should target. When you’re creating a social media ad campaign, such as Facebook advertising, you can precisely target a specific location. So, you can take benefit from this top countries report for improving your WordPress site’s content marketing. 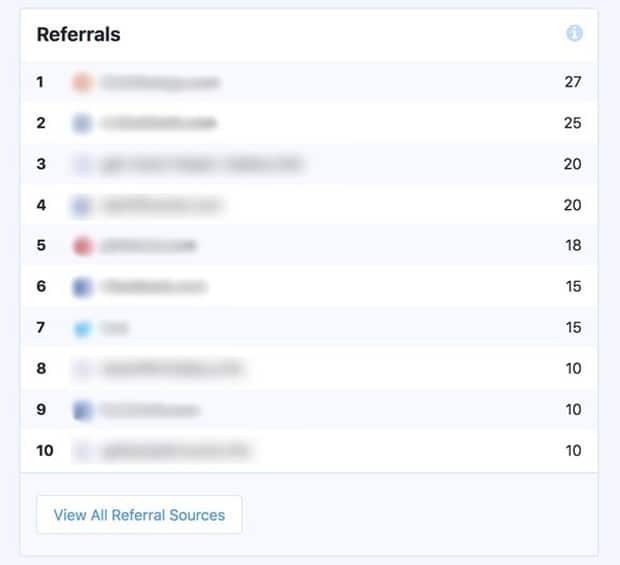 Referrals report is also available in the MonsterInsights overview report. So, you’ll need to simply visit Insights » Reports from your WordPress dashboard to find out which websites are sending the most referral traffic to your site. First, you’ll know what types of sites are recommending your content. You can go ahead and check your referral sites for more partnership opportunities. You can also approach them for cross-promotion campaigns or guest blogging opportunities. Next, you’ll know what type of content you should focus on. Since the sites have genuinely added your link on their site, they can add more of your links if you create something that complements their content or is useful for their visitors. That way, you can promote your content organically. Since we’re talking about content marketing, it’s crucial to know which content on your site is most popular and which is least performing. 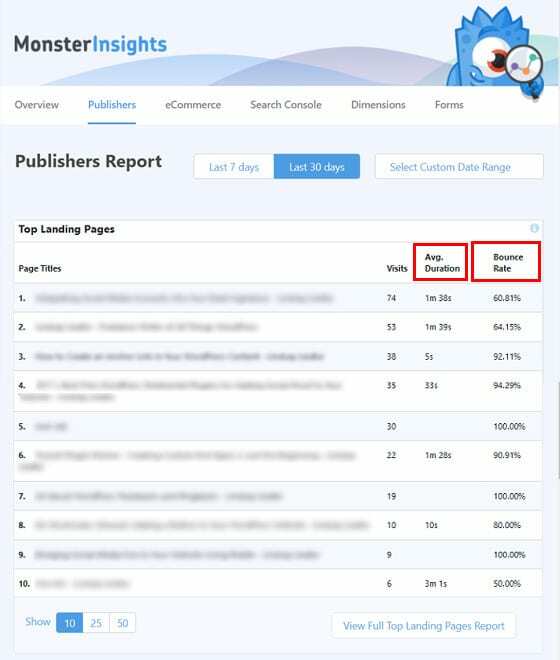 With MonsterInsights, you can view your top landing pages and top exit pages in the Publishers report. To view these reports, you need to visit Insights » Reports and then click the Publishers tab. Now, this gives you the clear idea of what type of content people are loving. Then, you can analyze it and create similar content. Also, you can use this information to boost these pages more by using them to create your newsletters, social media ads, etc. Another benefit is that you can make those top landing pages more conversion-ready with some changes. You can add call-to-action buttons, purchase links, and other converting elements on the page and make most out of your existing content. More conversions should always be the goal of your content marketing. Just like the top landing pages, the top exit pages are also important for making your content marketing right. This gives you the clear idea what type of content doesn’t work. So, when you know which pages are least performing, you can go ahead and make necessary improvements. Demographics report shows you who your website visitors are by their age, gender, and interests. This report is also available in the Publishers report page in MonsterInsights reports. As shown in the image above, you’ll be able to see which age group, which gender, and which interest group of people mostly come to your site. And, clearly, that’s the population you should keep in your mind when making your content strategy. For example; if most of your site visitors are between 25-34 years old, you have to concentrate on the type of content they’d like to see. And, when it’s ready, you should publish it at the right time when most of these people are likely to see your content. And, again, if most of your site traffic doesn’t represent your target audience, you can sense something has gone wrong. So, you can analyze and make the necessary changes. Besides, you can also target the right audience for your social media marketing campaigns with these demographic reports. 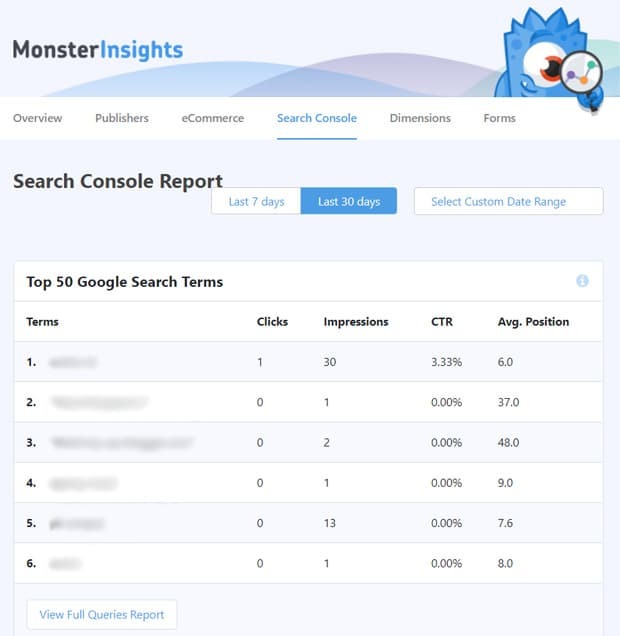 Using MonsterInsights, you can also view you Search Console report inside your WordPress dashboard. However, you have to first set up your Search Console account and connect it with your Analytics account. To view your Search Console report, you’ll need to go to Insights » Reports from your dashboard and then click the Search Console tab. As shown in the image above, you’ll see the top 50 search terms and total clicks, impressions, click through rate, and average search position for each term. First, it helps you to see which keywords on your site are bringing most of your organic traffic. From this, you can analyze whether your site is ranking for the major keywords you’re focusing or not. If they aren’t, you should concentrate on creating better content with those keywords. Similarly, you can also find out new keyword ideas from this report. Sometimes, your site can have keywords that are bringing a good amount of organic traffic without any effort from your side. This report helps you to discover such high potential keywords for your site. Google Analytics doesn’t provide custom dimensions reports by default; however, MonsterInsights helps you to track them with simple easy steps. All you’ll need to do is to install the Custom Dimensions addon and configure the settings in just a few steps. Now, with all these reports, you can make a proper content marketing strategy that works. 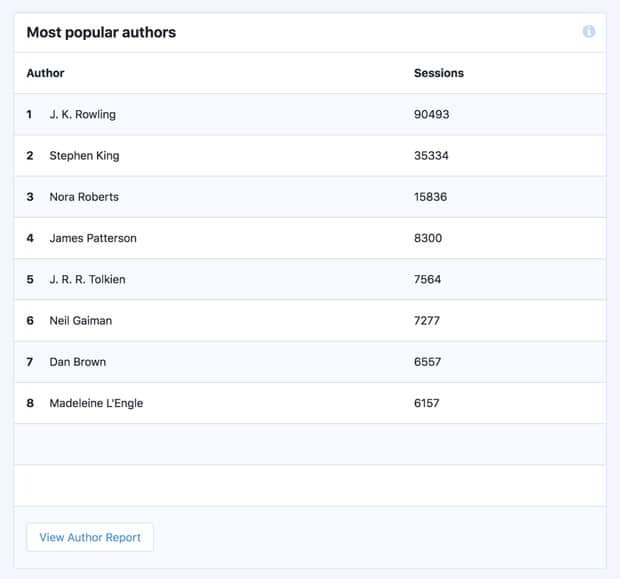 For example, the Most Popular Authors report lets you identify which writer’s posts drive the most traffic and engage most users. Now, you can reward the author and encourage them to work harder. You can also train the rest of your authors to follow the same technique. This enhances the overall readability of your blog and also helps to maintain a standard across your website. Similarly, the identification of the most popular category and post type also help you to improve content creation. You can create really useful and effective content after you have a clear idea what type of content actually works. We hope this article helped you to learn about 6 Google Analytics reports to improve your content marketing. If you want to see what other metrics MonsterInsights helps you to track, read our ultimate guide to MonsterInsights dashboard reports.